The BoBunny Blog: Home Decor Bo Bunny Style! Home Decor Bo Bunny Style! Hello, hello! Spring is in the air and the Bo Bunny designers have a few projects to make it feel like spring where ever you are. Get those rubons out of their packages and out on display in your living space! I know when I look at the Bo Bunny rubons I think they are too pretty to be hidden in an album and the Bo Bunny designers think so too. So today they are going to show you three home decor projects where the rubons are the star of the project. Wow, wow, wow! This frame is A-MAZING! I love how Irene applied the rubons directly to the acrylic to decorate her frame. Ahhh, what a cute little Angel Juliana made! 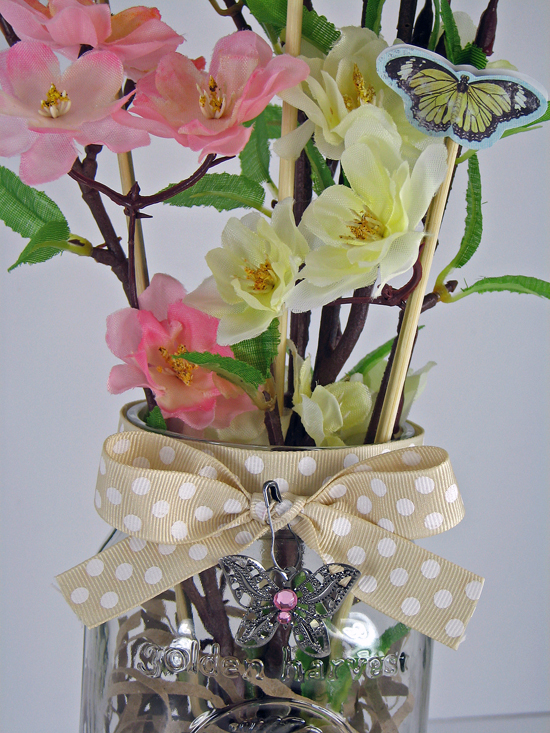 The butterfly rubon from the Country Garden collection makes this angel ready for spring. I decided to use the country garden rubons too. 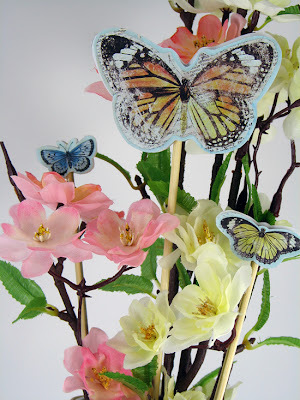 These butterflies are hard to resist! I used a mason jar that I bought at Goodwill for a quarter as a vase. For the rubons I applied them to patterned paper and cut them out. I then traced them onto another sheet of patterned paper and cut out that outline. I adhered the two cut-outs with foam tape. I cut three bamboo kitchen skewers to varying sizes and stuck them through the foam tape inbetween the butterflies. A little trinket through the ribbon completes it. Thanks for coming by today! I hope we have inspired you to get out your rubons! All the projects are so beautiful. Great inspiration for home decor projects. Love these great new rub-ons. The jewels are exquisite too. Happy Spring ! Love the cheerfulness of the projects.